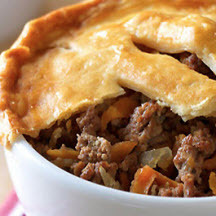 Ground beef easily takes the place of traditional leftover roast beef in this tasty "Pasty Pot Pie"! Combine ground beef, carrots, potatoes, onion, salt and pepper in large bowl, mixing lightly but thoroughly. Divide mixture evenly into 6 (8-ounce) oven-proof ramekins or bowls, packing mixture down evenly. Set aside. Unfold pie crust on flat surface, pressing out fold lines with fingers. Cut crust evenly into six circles, about 3 3/4-inches in diameter. Place crust over each ramekin allowing edges to drape over ramekin rim; crimping edges to seal. Cut three slits in crust to vent; brush top with egg. Place ramekins on lined baking sheet. Bake in 400°F (205°C) oven 30 to 35 minutes, until instant-read thermometer inserted into center registers 160°F (71.1°C) and crust is golden brown. Let stand 5 minutes before serving. Serve with ketchup or gravy, if desired. Note: Cooking times are for fresh or thoroughly thawed ground beef. Ground beef should be cooked to an internal temperature of 160°F (71.1°C). Color is not a reliable indicator of ground beef doneness. Nutritional Information Per Serving (1/6 of recipe): Calories: 362; Total Fat: 15g; Saturated Fat: 6g; Cholesterol: 96mg; Total Carbs: 31g; Fiber: 2g; Protein: 26g; Sodium: 634mg.